Product #60617 | SKU 5-202 | 0.0 (no ratings yet) Thanks for your rating! 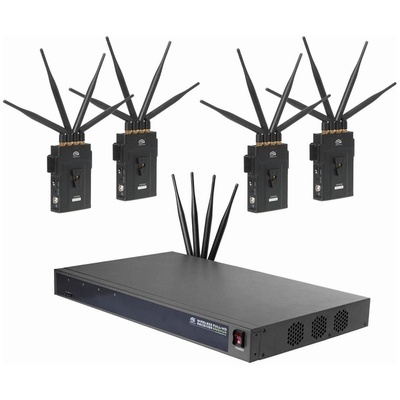 The Cinegears 2000M-R Wireless 4 x 1 SDI and HDMI Video Transmission Kit includes four transmitters and one rackmount receiver. Each transmitter features one HDMI and one 3G-SDI input, and the receiver features four HDMI and four 3G-SDI outputs. The 2000M-R system also supports tally functionality via its RS-232 ports. Your HDMI or SDI signal is carried with a low-latency rate of less than 60 ms over the licence-free 5 GHz frequency band. Each transmitter can send 8 Mb/s video from up to 1640'/500m away or 15 Mb/s video from up to 984'/300m away. The set is also capable of HDMI-SDI cross-conversion, so you can input a signal via HDMI and output through SDI, or vice versa. Each transmitter includes a LEMO to D-Tap cable, and they are powered by separately available AC sources or D-Tap batteries. The receiver is powered by a standard AC power plug, which is included.